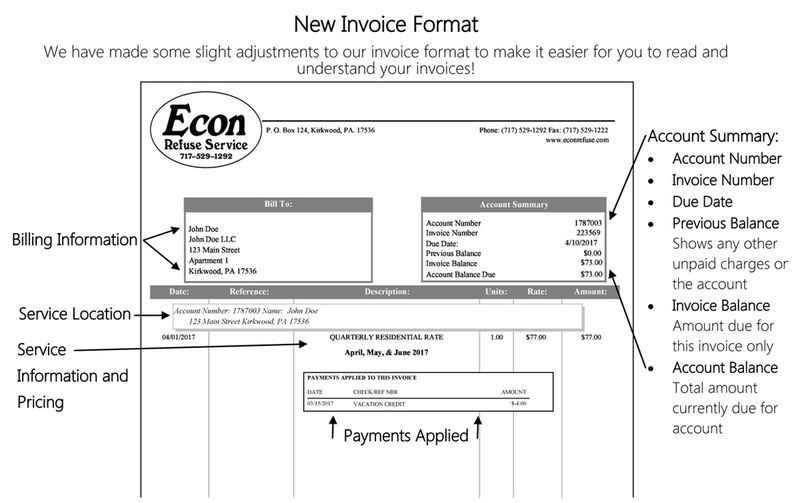 Switch to paperless billing (E-Statements). First time user? Follow these steps. Payments made after 3:30 p.m. will be applied the next business day. If you have any questions please contact our office at 1-717-529-1292 during business hours or email us at customerservice@econrefuse.com. For your convenience, there are several ways to pay your bill. To ensure your payment is applied to your account correctly, please include the bottom portion of your invoice with your payment. You can also write your account number in the memo line. Please allow 7-10 days for a mailed payment to post to your account. If you are paying through your financial institution, please note that the payment may take 7-10 business days to reach us, as payments are received in check form. Over the phone payments using credit/debit cards or checking/savings accounts are free and easy, just give us a call! Office hours: Monday – Friday 8 a.m. to 4 p.m. If you are interested in having payments automatically deducted from your debit or credit card or from your checking or savings account, please fill in the appropriate form, listed below.